If the anvil is old and used it may already be dressed. If the anvil is antique you need to carefully evaluate any changes. If the anvil is old and has been weld repaired or machined and the corners sharpened then this was a waste of labor I hope you did not pay for. Machining also reduces the thickness of the steel plate AND depth of hardening leaving the anvil soft and easy to mark. Used anvils often have cut surfaces that can be easily dressed out with a sander. AND for some reason every old anvil I have seen has had the tip of the horn hammered on and mushroomed. This should be gently dressed off. Note that the point of an anvil horn is blunt ranging from a 3/8" flat to 3/4" on large anvils. This is for safety. Where old anvils have been badly chipped they should be smoothed out and the corners radiused as above. When chips are too deep for a radius to clean up just blend them in a little to remove sharp edges that may mark your work or chip again. It is MUCH better to gently dress anvil corners than to weld them up. Welding results in hard and soft places and conditions that are likely to produce cracking or chipping (again). Most anvils that are badly chipped would not have been if properly radiused to start with. 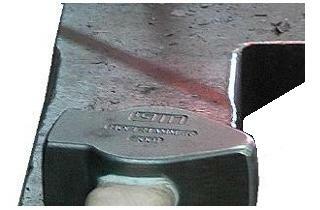 Hofi Anvil with short dressed sections at middle of anvil. This is a very modest radiusing that is typical on many profesional's anvils. This is between a 3/16" and 1/4" radius. Others will carry the radius around the corner along the side shelf and run the tapering radius farther along the far edge. Continuing around the inside corner at the shelf makes a very nice saddle for dressing many things. Demonstrators and Others take note! No matter how badly you want to dress the corners on that demonstration site anvil DO NOT DO IT! In recent years major suppliers have LOANED brand new anvils to organizations to use for demos and they have come back with rounded corners! The demonstrators had absolutely NO BUSINESS doing this unless they were prepared to purchase the anvil then and there. If you want it your way, ship your anvil to the demo. My First Anvil A true story.